I hope your keeping toasty warm during this frigid cold snap. Even though I have Husky in my blood, I'm not spending too much time outdoors. I'm staying toasty warm inside the Shop. We're kicking off the year with a Sale!!! 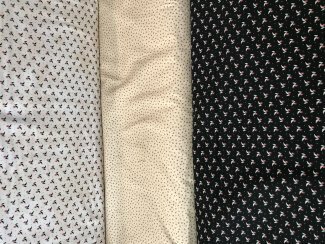 We have 25% Off Christmas Fabric and 20% Off Regular Priced Fabrics until Saturday, January 13th. I also have a small favor to ask. A friend of my Mom's is having a birthday party at the end of January for her Granddaughter. She is looking for empty thread spools to do a craft activity at the birthday party. If you have any empty thread spools your throwing out and are coming to the Shop, we would appreciate any size and type of empty thread spool. We've been posting some cool stuff on our Facebook Page. 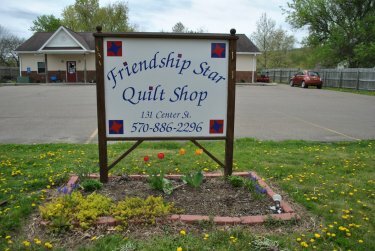 Elizabeth will be teaching her first quilting class on Saturday, February 24th. 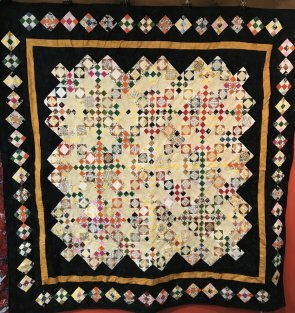 We will have more information later this month but, here's a photo of the quilt she will be teaching. 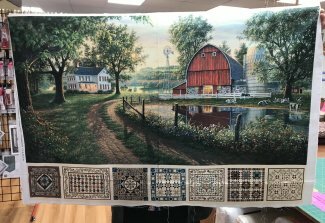 We hope Elizabeth can get some quilters to sign up for this class next month. She says it's not as hard as it looks. It's a fun quilt to make. We have an cool new digital panel from Northcott and 2 coordinating fabrics to go with it. 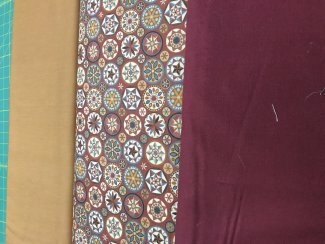 The coordinating fabrics are the solid burgundy and burgundy print. The tan was one we were playing with. There is also a free pattern available for this quilt on Northcott's website. We also have a new Primitive Gatherings Collection from Moda just in, too. That is all the news I have for today. Stay toasty warm this weekend. It's going to get better next week, I hear. It's too cold for Moda to come out to work. So, she won't be in for a little while.